Megu, a Japanese “clubstaurant," has moved into the former home of subterranean upscale spot Cherry in the Dream Downtown hotel. (Two former Megus in NYC closed abruptly several years ago.) Megu serves dishes like nori salmon belly taco and Wagyu carpaccio in a technicolor, 2,800-square-foot space. Megu, Dream Downtown, 355 W. 16th St., New York, NY 10011, 212-885-9400. Quality Branded, the hospitality team behind restaurants like Quality Eats, opened a nigtclub called Squares. The swanky design features 25,000 Japanese glazed tiles and smoky mirrors. Squares will serve custom cocktails and small bites like caviar and salmon checkers. Squares, 360 Park Ave. S., New York, NY 10010, 646-455-0042. Drunken Dumpling brings giant soup dumplings to the East Village. The mother-son team behind the eatery serves something called XL Xiao Long Bao, a gigantic soup dumpling. The signature item is stuffed with crab, scallop and shrimp and is nearly the size of a bowl. They will also offer smaller soup dumplings, pork buns, saké, wine and beer. Drunken Dumpling, 137 First Ave., New York, NY 10003, 212-982-8882. Online bakery Mah-Ze-Dahr has opened a brick and mortar outpost in the West Village. Baker Umber Ahmad now has a storefront to sell her beloved cocoa-cookie-crusted cheesecake, brioche donuts and brown butter blondies. She also offers buttermilk biscuits, savory pies and gluten-free treats. Mah-Ze-Dahr Bakery, 28 Greenwich Ave., New York, NY 10011, 212-498-9810. ReViVer is a fast-casual spot offering a health-driven menu of tacos, salads and sandwiches. It’s the second location of the restaurant (the other outpost is at Columbus Circle, 934 8th Ave., 917-475-1711). Balanced meals like mahi curry and a steak and fig salad are prepared with wholesome ingredients. The cheery space sports a colorful mural by local tattoo artist June Jung. ReViVer, 303 Park Avenue South, New York, NY 10010, 646-952-0014. The PokéSpot serves up customizable bowls of poke, the Hawaiian raw fish dish. Select from various bases, proteins, mix-ins, toppings and sauces. Several signature bowls are also available. The PokéSpot, 120 Fourth Ave., New York, NY 10003, 212-933-0971. Chefs Clare de Boer and Jess Shadbolt met at London's The River Café. At King, the team’s new spot on King Street in SoHo, dishes will take their inspiration from the south of France and Northern Italy, and strive to be both refined and satisfying. King, 18 King St., New York, NY 10014, 917-825-1618. Neapolitan pizza spot Motorino has opened a location on the Upper West Side. The newest outpost of this beloved mini pizza empire serves nine wood-fired pies and starters like salads, chicken wings and baked clams. Motorino Upper West Side, 510 Columbus Ave., New York, NY 10024, 917-675-7581. Classic burger and milkshake spot Harlem Shake, which has a cheerful, vintage feel, has opened a second location in East Harlem serving breakfast, lunch and dinner. The restaurant will also offer artisanal sodas and wines by the bottle and glass, and have an expanded beer program. Harlem Shake, 2162 2nd Ave., New York, NY 10029, 212-222-8300. Benoit, the American spinoff of Alain Ducasse's 104-year-old Parisian bistro, has reopened with a new look and a bright blue awning. Expect some fresh dishes on the menu, too, like lamb chops served with confit lamb shoulder. Benoit, 60 W. 55th St., New York, NY 10019, 646-943-7373. Mekelburg's, the gourmet store, bar and restaurant in Clinton Hill, is now open late, from 11 p.m. to 2 a.m. during the week and from 12 a.m. to 4 a.m. on Friday and Saturday. The place will serve a special late night menu, and all wine and beer will be $1 off for a late night happy hour. Mekelburg's, 293 Grand Ave., Brooklyn, NY 11238, 718-399-2337. New York institution Carnegie Delicatessen will close its doors on December 31, 2016. It's one of the best places to get top-quality (and lean) corned beef and pastrami, enormous overstuffed sandwiches and real New York deli ambience. 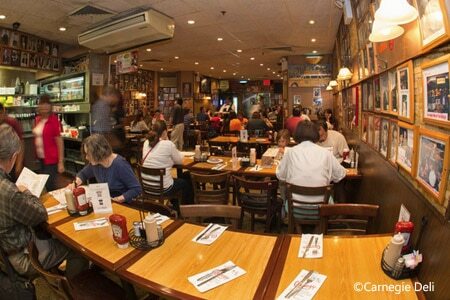 Carnegie Delicatessen, 854 Seventh Ave., New York, NY 10019, 212-757-2245. The much-loved Blue Ribbon Bakery and restaurant will close at the end of November, when the owners' lease ends. The restaurant fopened in 1997 after the Blue Ribbon team spent years restoring its 150 year-old oven, and became famous for its updated American classics like fried chicken and bone marrow. Blue Ribbon Bakery, 33 Downing St., New York, NY 10014, 212-337-0404. David Chang plans to temporarily close Momofuku Ssäm Bar for a facelift, and after five years, food-science whiz Dave Arnold’s cocktail hotspot Booker and Dax will leave the spot as well. The space will become a private event room. The team is looking for a new space. Booker and Dax will close after service October 15, 2016. Booker and Dax, 207 Second Ave., New York, NY 10003, 212-254-3500.